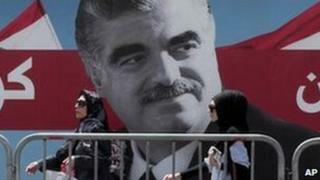 The UN-backed tribunal investigating the 2005 assassination of former Lebanese Prime Minister Rafik Hariri has indicted a fifth suspect. The Special Tribunal for Lebanon said the indictment for Hassan Habib Merhi had been secretly issued to Lebanon in August but only now was made public. Four members of the Shia Islamist group Hezbollah were indicted in 2011. None of the five suspects has been arrested. They are expected to be tried in absentia in January. Hezbollah denies any role in the killing of Hariri and 21 others in a car bomb attack in Beirut in February 2005. The group's leadership has refused to hand suspects over. On Thursday, The Hague-based tribunal said it had confirmed the indictment - and also an arrest warrant - against Hassan Habib Merhi. It said it had acted because the Lebanese authorities had so far failed to find the suspect. The tribunal said the move was aimed at finding "alternative means to search for the accused". It also urged Beirut to "reinvigorate and intensify their efforts to apprehend" the suspect. Rafik Hariri died when a suicide bomber drove a van packed with 2,500kg (5,510lb) of explosives into his convoy on the Beirut waterfront. His assassination plunged Lebanon into a series of political crises, killings and bombings that led to sectarian clashes in 2008, dragging the country to the brink of civil war. A Western-backed government led by Hariri's son Saad collapsed in January 2011 largely over its support for the tribunal. Hezbollah leader Hassan Nasrallah has dismissed the indictments as a failed attempt to sow strife and says the tribunal is a tool of US and Israeli policy.